Racing Single speed with Fuzzy John: Call it a come back. Last Saturday was the Wilderness 101, the 5th race in the NUE series. Dejay was leading the overall with a total of 6 points and I was in second with 11 points. I had some serious ground to make up! But it wasn’t quite as bad ad it seems as they only count your best four races, my worst score was a 7th, all possibilities point in the direction that I will be throwing out that one and end up with less the 11 for a total. Other than Dejay there are always a bunch of other fast single speeders that could be in the running. Like Matt Fararri, Topher, Gunnar, Tim, Slohio Rob(now AshvilleRob) and the big name for this weekend was Wes Schempf. Wes won the USA Cycling national championship XC and short track in the semi pro category the previous weekend, he is from PA , and was the fastest single speeder last year in the 101. The race actually started with a neutral roll out that was truly neutral, there were even a few single speeders on the front for a while. But that never lasts long enough and the first hill ripped the group to shreds. For a mile or so I was the leading singlespeeders and shortly after I let the lead group go Wes came around me and went with them. My plan before the race was to let him go early expecting that he would fade. The front group was out of sight before the descent and was pulling farther away. I settled into my pace for the long flat sections and was joined by Tim, Gunnar and Matt. Tim didn’t last long before his faceplate broke, but Matt and Gunner stayed close. Even though they were locals they let me on the single track first and instantly I had a gap so I figured it was time to go. I build a minute or so before I was brought to a stop by a pit bull that thought he deserved the trail more than me. I didn’t argue but I cussed a bunch after I made my way around him. Matt and Gunnar had me in their sights when we hit the next climb but I hit it hard again and I don’t think they saw me again after the first switch back. Now all I needed to catch the semipro national champion and maybe a few geared guys as well. Luckily I had a few friendly geared guys that helped me out and pulled me though the next flat section to aid two. A quick exchange of bottles and I was off. The longest climb of the day was coming and I was feeling great, time to make a move. I found myself a the back of a pace line, I spent my time in line then did my pull. Unfortunately after I was dome there was only one guy left and he was only good for a second pull. I found another piece of motivation not to far up the road, Wes. I gradually pulled him in through the rest of the climb and had him within 40 seconds and caught him on the descent when he was having problems with his bike. No attack was needed, as soon as I passed him he stopped to work on his bike. I was now in the SS lead a feeling as good as I did on the starting line, now it was time to get those geared guys! I passed a hand full more on the hills before aid three. But then the rough course started taking it’s toll on the bike. Around mile 45 my chain started to come off, and it continued to do so for the rest of the day, it came off 20- 25 times. And I flatted on one if the steep rocky descents, that wasn’t too bad it just needed a quick blast of Co2 to keep the Stan’s no tubes rolling. Then after mile 60 I only passed on other and chased one to the finish. In the end, I was the fastest singlespeeder and 9th place overall. 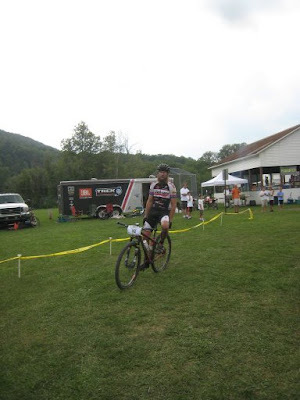 I set the Single speed course record and I beat Wes who finished 2nd by 21 Minutes and Dejay came in 10th. So the series… I have 12 points and Dejay has 16 and if you remove our bad races I have 5 and Dejay has 6. Thats a pretty close series. It's mostly accurate. Harlan, My name is spelled Mylne and I that was my first NUE win this year, I have two second place finishes though. would a derailleur change your day? (spelling is not a strength of mine... as a person with few strengths... with spell check I should be able to achieve that... getting someone's name right is a basic courtesy... I bet Harlan gets it right next time!